Here’s another tough reader’s request! The reason this is tough is that the answer will totally depend on where you live! Here in Seattle, it is unseasonably cold- so I would suggest a jacket or sweatshirt for the market. Whatever you do, please don’t wear the outfit on the right. The cropped jeans are too short. By ending right below my knee- they make my legs look awkward and goofy. The cut of these jeans is also too loose, which is hard to see in the photos, but there is no shape to them. The gray fleece is so dull and boring, and lacks shape. As for the tennis shoes- you all know how I feel about them! The outfit on the left is an improvement. 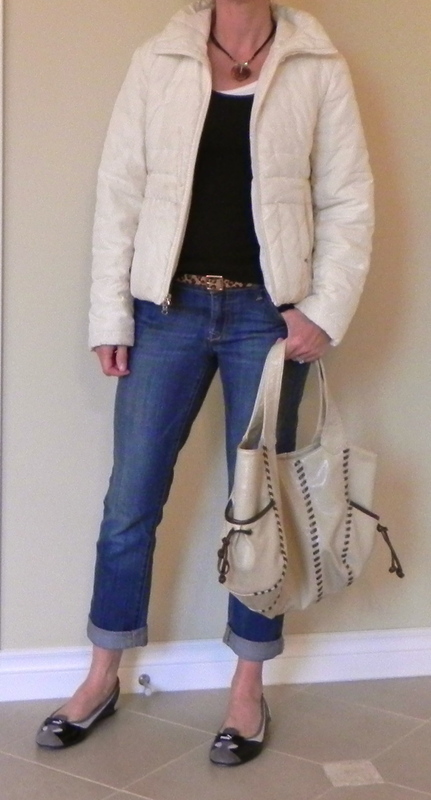 The cropped jeans are a better fit, the cute quilted jacket will keep me warm, and the small details of the leopard belt and cute necklace give the impression that I made some effort. I’ll be the first to admit, it isn’t the most fashionable outfit you’ll ever see- but keep in mind- this is for the market! Keeping is casual is key! There are a few more important things to consider when choosing an outfit for a farmer’s market. One is that you want to be comfy, this means wearing supportive shoes (no flip flops or heels). You’ll also probably get dirty – so wear something that can handle a little dirt (those fruits and veggies come with the dirt on them), if it’s sunny- bring a hat to protect your face and lastly, you’ll need a great bag to carry your purchases in. I’ve put together a few more looks below of suggested outfits, but please comment with your suggestions! This fleece is a good alternative to the gray one- it’s a bright eye catching color, and has a little more shape to it. This black fitted one is also flattering, it defines my shape and has an interesting collar. If you’re lucky enough to live somewhere warm- this would be a cute outfit. It is Jennifer Aniston inspired- just a simple tank and jeans- but notice the small details (belt, necklace, fitted tank). How are your feet feeling these days? Have your new shoes helped? I think all of your casual outfits look great! My feet are feeling so much better now that I am making better shoes choices. Dankso, Naot and Birkenstocks have been my best friends lately. All options are cute. I’m not a big fan of fleece pullovers in general, but the nice berry color saves it, plus the cut! (I’m really sick of fleece here in B’ham!) Maybe one day we’ll be able to go to the farmers market in the outfit in the last photo!